A few weeks ago we went to Barnes and Noble because my son wanted to buy some expansions for his board game. He is very into board games at the moment and ropes anyone even semi-willing into playing with him. Many of them are more fun than I would have thought. Though I must admit, I didn't know there were so many Star Wars board games. I think he is determined to own all of them. We are trying to convince him to expand his collection beyond Star Wars. He says it sounds like a good idea and then he gets pulled in by the expansion sets and decides he just has to have Chewbacca or whatever. Anyway, he was taking an endless amount of time to decide exactly what he was going to buy and I was entertaining myself by browsing all the sections of Barnes and Noble I don't usually have time to investigate. 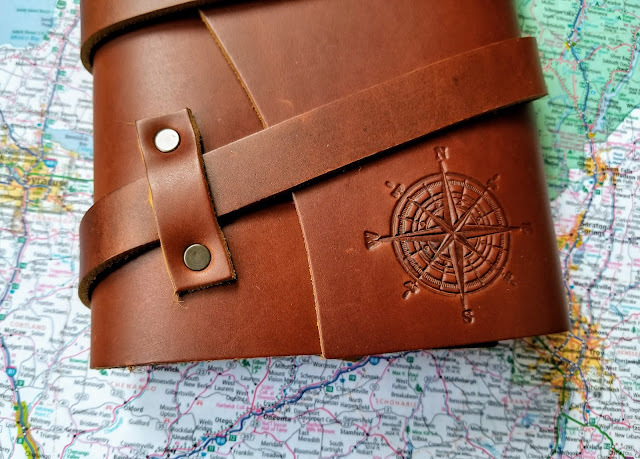 This led me to the journal section and I discovered the wonders of leather journals. It was love at first sight. They were so pretty and they smelled so good and just imagine the wonders of writing in one. They were also about $40.00. I just couldn't. Not for a journal that I would fill up and then be done with. So I reluctantly walked away, towing a Star Wars laden son behind me, and regretted it as soon as I was home. Well, kind of regretted it. I wanted a leather journal but I decided the dream was a refillable one. I emerged from the depths of an internet search later that evening having discovered Portland Leather Goods. They actually have an Etsy shop as well and they were having a sale. An endless amount of dithering later (maybe this is where my son gets it) I ordered a journal. There were quite a few decisions and I am not good at decisions. 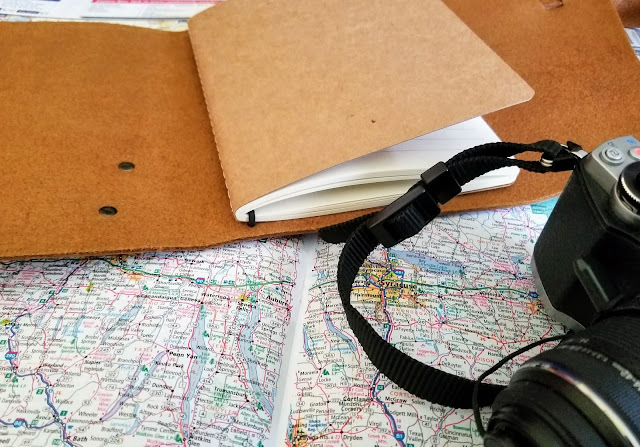 You can choose from a variety of leather colors and there are approximately 50 different brands you can choose to put on the front. I chose the compass but there were also mountains and sayings and even Calvin and Hobbes. You can add your name or initials which I chose not to do. Also, you have to decide about the stone on the wrap. Do you want one? What color? Maybe a bit of wood instead? Then do you want lined or unlined paper? So many choices and all of them appealing. The notebook is held in by a sturdy elastic band. 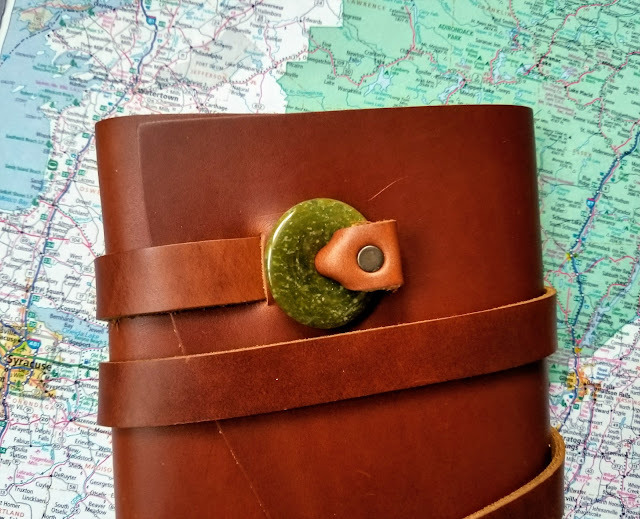 I messaged the company asking if it was possible to add a second elastic so I could have two notebooks inside the leather cover. They answered very quickly and said they were willing to do it but they did not recommend it because they felt it might make the cover not fit as well. The wrap wouldn't go around as well and the brand might be in the wrong place. I said, in that case, just stick with the one notebook. I do regret that decision now though. There is plenty of room for a second elastic and the leather cover would easily fit around. It is unfortunate, but I will probably just look for a thicker notebook when I replace the one that came with it. This is in no way a sponsored post I just really, really love this journal. Do you know how sometimes you buy something that just makes you happy? Well, this journal is making me happy. And, because it is refillable, I can enjoy it for years to come. Portland Leather Goods also makes gorgeous tote bags. So tempting. They are more expensive than I would usually buy (because I am...frugal. Let's go with frugal.) but they are beautiful, probably would get better with age, and they would last forever. I really want one. Maybe one day. Oh the rich aroma of leather.... I am sure it will contribute to many musings. It does smell wonderful. I think the leather will just look nicer as it gets older. beautiful! I'd like one too but the cost puts me off always.. I know. They can be expensive. That is why I was so happy to find this for 50% off. This is GORGEOUS! Thanks for introducing us to Portland Leather Goods. It is gorgeous, isn't it? I feel like knowing about Portland Leather Goods could be a bit dangerous! It is all so tempting. WOW! 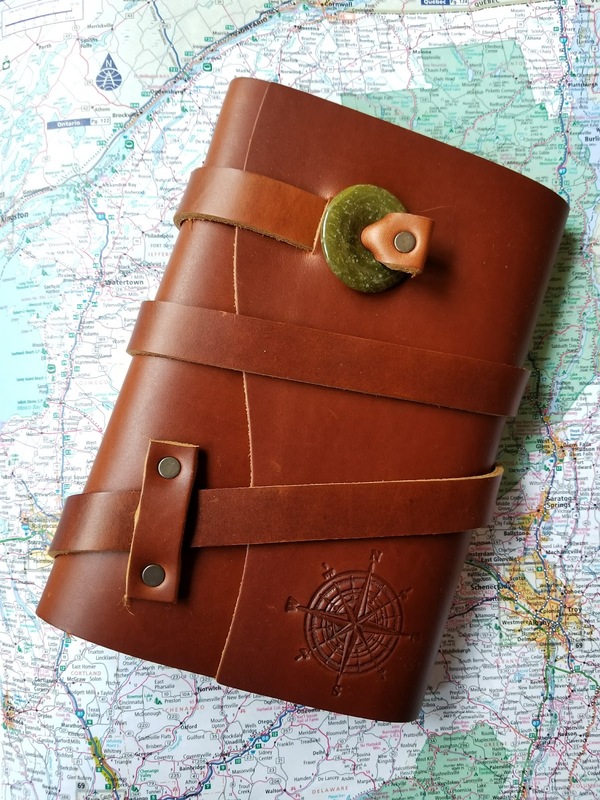 I love the idea of a refillable leather journal. I have a couple leather journals, but they are too expensive to get unless they're really special. This is a great idea! DUDE, they're still having a sale. I suspect some Christmas presents will be bought there before the end of the day. Aren't they beautiful? Even knowing it is refillable I have to convince myself it is okay to just throw it in my bag and carry it around with me. I saw that the sale is still going on. I am trying to ignore it because I really want one of the tote bags. Of course, my version of "ignoring it" means I only check every now and then. I don't think this is going to end well for my budget. I ended up ordering FOUR of their journals. But only one is for me! The others are Christmas presents for dear friends :-) I can't wait to get them!!! You must have had fun picking which ones to buy. 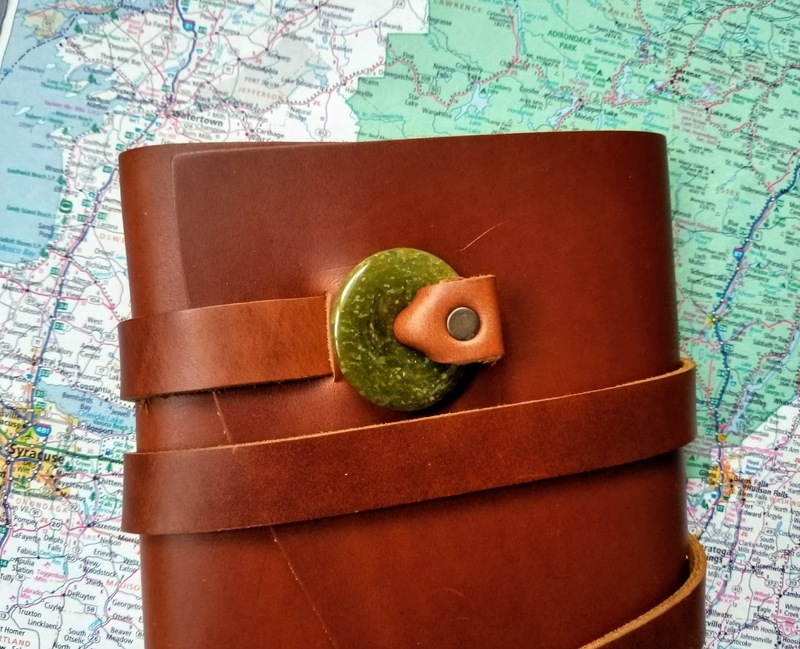 I saw that the snap journals are available again. Those were out of stock when I ordered. Your friends are going to be very happy! I decided against the snap journals just cuz the other ones were more unusual and cool. I think they're all going to love them, as they're all also writers :-) Just looking at them on Etsy makes my fingers itch to write in them.